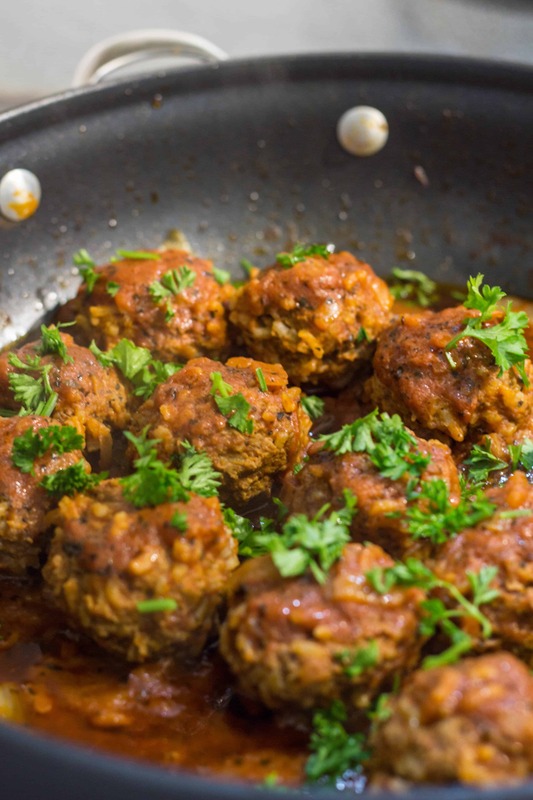 These Meatballs with Rice Tefteli is a perfect 30 minutes comfort meal recipe! Easy to make, it will be your family favorite! This is not your average meatballs. this is delicious soft meat-in-rice tefteli cooked in mouthwatering flavorful tomato sauce. Sounds good, right? You should actually make these meatballs and tell me your opinion. So, these meatballs are something in between of your regular meatballs that your mom used to make (but softer and have rice inside) and Russian tefteli (but more tart). And they are cooked in tasty tomato sauce with lots of onion and garlic. It is a great comfort meal for cold winter evenings and I am sure your family will love it and will ask for some more. This is not your average meatballs. this is delicious soft meat-in-rice tefteli cooked in mouthwatering flavorful tomato sauce. Cook the rice half through. It should be only half cooked because we will continue to cook it with meat later. In a large mixing bowl, mix together ground beef, rice, and grated onion. Season it with salt, pepper and a pinch of smoked paprika. Roll the mixture into balls (standard meatballs size). In a large preheated pan, add tomato sauce and 1/3 cup of water, stir it. Add chopped onion and garlic. Season with salt, pepper, a pinch of sugar and smoked paprika. Bring it to boil, then reduce the heat to medium/low and simmer it for a few minutes. Add the meatballs, cover with lid and cook for 20 minutes over medium heat. Turn the meatballs over every 5 minutes. Serve warm with a side dish of your choice.